Maybe someone find it useful, I used it in my game that I never finished ..
Gideros has a plugin for a C version of Bump - it does this sort of collision detection (and more) and may be faster - you should take a look. Yes, that works great too. I usually use this method, but inline. Bump has a few advantages as it calculates the rebound and the actual collision point - even if an object is travelling faster than the size of the collision square. Bump is basically a spatial hash with extra features (collision). You can query it with rectangles, points or segments. It is a fantastically robust addition to Gideros. Can someone convert my example project to cbump, I really would love to try it but don't have time to study it. 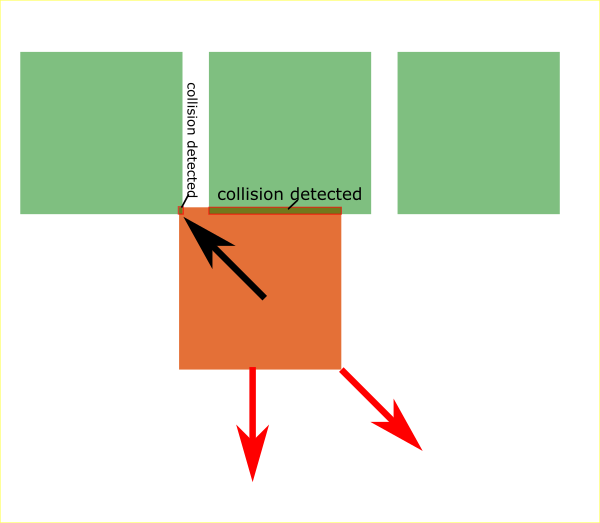 Bump has a few advantages as it calculates the rebound and the actual collision point - even if an object is travelling faster than the size of the collision square.